April 5, 2018 – Auburn, NY - The 2018 Finger Lakes Sweet Treat Trail will kick-off on April 14 & 15 at the Va Va Bloom Garden Show at Dickman Farms, 13 Archie Street, Auburn from 9 a.m.- 5 p.m. Saturday and 10 a.m. – 5 p.m. on Sunday. Join us for a weekend that will be blooming with inspirational flowers, workshops, seminars and an awesome farmers market featuring over 50 local artisans, wineries, breweries & more! 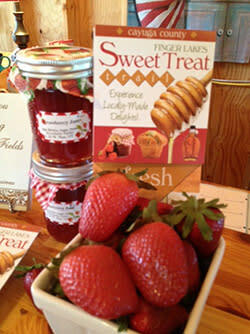 Stop by the Finger Lakes Sweet Treat Trail table for free tastings as well as a complimentary tote bag and spatula for the first 50 guests each day. Pick up the 2018 Finger Lakes Sweet Treat Trail brochure and pass to all the participating sites so you can start planning your own personal tasting tour! The family-friendly Finger Lakes Sweet Treat Trail is all about the locally grown and produced sweet treats that Cayuga County has to offer. Whether its honey or jam or homemade cookies, this self-guided tour along 19 stops from Fair Haven to King Ferry has something to satisfy everyone’s sweet tooth! This year the Sweet Treat Trail will be open May 5 – November 25, covering three seasons of sweet treat goodies from tasty strawberries in June to crisp local apples through November.